I hope you are all having a great Saturday! Today we are going to chat about Country Music superstar Brad Paisley and his signing habits. Most of the stars of country music are very good to their fans. Mr. Paisley is no exception. I have personally encountered him on three different occasions. Each time he has been amazing. He takes his time with his fans in every way imaginable. I have seen him pose for pictures and chat with his admirers on every possible subject. I saw him sign what must have been 20 different items for one older collector. He has to be one of the best signers I have ever witnesses. 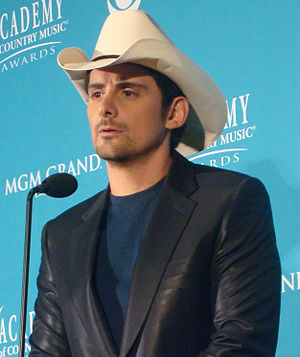 Brad Paisley is a superstar on and off the stage! If you ever see him, don’t hesitate to ask him for his autograph. I promise that you won’t be disappointed! Feel free to check out my autograph website www.autographedfirstdaycovers.com. This entry was posted in Uncategorized and tagged academy of country music, billboard, cma, country and western, hank williams, nashville. Bookmark the permalink. Pingback: Brad Paisley, “Who Needs Pictures.” Official Full Length Country Music Video. « Top 5 Gone Wild: Country Countdown.